11-year-old Brett Haubrich of south St. Louis County to make his wish, he not only listed none of those things but had no request at all. "He didn't want anything," explained his mother, Eileen. "They had to keep asking him, 'What would you like to do? Do you want to meet anybody? What do you want to be when you grow up?'" The answer to the last question became part of his wish — what Make-A-Wish calls "wish enhancement" to complement the main wish. The sixth-grader at St. Mark School wants to be a priest, a doctor or an engineer, in that order. "I said, 'I really want to be a priest,'" he said. So, on Holy Thursday, at the invitation of Archbishop Robert J. Carlson, Brett took his place beside the altar at Cathedral Basilica of St. Louis as "Priest For a Day." Brett served not one but two Masses — the Chrism Mass and the evening Mass of the Lord's Supper — and held the book for Archbishop Carlson for prayers after the homilies. At the evening Mass, he was with 11 seminarians having their feet washed by Archbishop Carlson, and his parents brought up the gifts of bread and wine. He also joined Archbishop Carlson for two meals; a luncheon with archdiocesan priests and deacons after the Chrism Mass and a dinner with seminarians at the archbishop's residence before the evening Mass. Best of all, he wore a collar provided by a seminarian from Kenrick-Glennon. As for his favorite part of the entire day, Brett was unequivocal in his answer. "The whole thing," he said as he waited for his dad, Conrad, near the Cathedral Basilica sanctuary with his mom and older sister Olivia after the Chrism Mass. "It was really neat for them to let me do this stuff." And cool, too — a term he used often in describing the day. "Just a really cool experience," he said. "Eating mangoes on a beach," his mother said. That trip will come later. His interim "priest-for-a-day" request didn't surprise his family. "For years, he has loved the Mass and been religious," said Eileen Haubrich, a graduate of Notre Dame High School. "He has such a good heart. He's a very caring boy." The second of Eileen and Conrad's four children and oldest of two sons, Brett has served at his school church and at his parish, St. Martin of Tours, which is visible from the back door of his house only a short walk away. He digs the smell of incense burning in the thurible, enjoys confession and likes "communion, and the songs, too." Communion — the Eucharist, the living presence of Jesus Christ — stands out. Brett and his family told several priests about his request, and they offered several options – like shadowing one, spending the night at a rectory with his dad or serving a Saturday morning Mass at the New Cathedral. The latter request was made of Father Nick Smith, the Master of Ceremonies at the Cathedral Basilica. His initial response was "no way," followed quickly by "we can do way better than that." "I said, 'Why don't we have him come down for Holy Thursday? He can serve the Chrism Mass — it's a Mass for priests — and that night mass is always about the Eucharist,'" Father Smith said, repeating the two main aspects of the Masses that fit Brett. "Priests and Eucharist." "It just so happened he was standing right next to me," said Father Smith, who described Archbishop Carlson as "very excited. He was throwing out ideas right and left, 'Let's do this, let's do that.'" Archbishop Carlson came up with ideas of the seminarians dinner and of the foot washing. "He said, 'Put him in there; we'll wash his foot,'" Father Smith said, with a laugh. "Before you knew it, it turned into a whole day." Father Smith prepared an itinerary and delivered it in person along with a letter signed by Archbishop Carlson asking for Brett's help at the Masses. "I handed it to him, and when he got to the first line, 'I'm making you a priest for a day,' his eyes got as big as half-dollars," Father Smith said. Brett admitted to being a little nervous heading into Holy Thursday, but the events went off like clockwork. Wearing the collar, Brett processed down the center aisle at the New Cathedral with priests, deacons and seminarians at the Chrism Mass — at which Archbishop Carlson blessed the oils to be used throughout the archdiocese for sacraments for the next year — and took his spot near the altar. "He did pretty well," Archbishop Carlson said. Fortified with the Sacraments of Holy Mother Church Wednesday, January 10, 2018 after a long, valiant battle with brain cancer. Beloved son of Conrad Jr. and Eileen (nee Venverloh) Haubrich; loving brother of Olivia, Andrew and Ella Haubrich; dearest grandson of Dan and Carol Venverloh and the late Conrad Sr. and Teresa Haubrich; our dear nephew, great-nephew, cousin and friend. Brett was a sweet and fun-loving 14 year old boy. He was diagnosed with Anaplastic Astrocytoma grade 3 brain tumor in June 2014. He was the most healthy boy aside from headaches that started when he turned 11 the end of May 2014. He endured 7 weeks of proton radiation and chemo, then 10 months of chemo. His tumor was responding to treatment. Chemo was done Aug. 2015. The tumor showed signs of growing on the Nov. 2015 scan. He had a new MRI laser procedure to ablate the tumor in Jan. 2016. He Then had another laser surgery in April 2017 due to a fast growing recurrence. He was in rehab for 2 weeks and a total 1 month hospital stay. This surgery affected his speech and communication. He began immunotherapy. He was determined to get better. He was a religious boy, attending Bishop DuBourg high school. 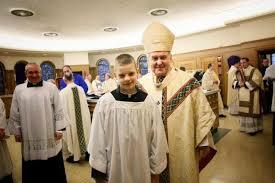 He was priest for a day for his make a wish and joyfully served mass for the Archbishop. His heart was pure and he just wanted a chance to grow up. TEAM BRETT raised over $10,000 for the St. Baldricks Foundation in the hopes that other children would not have to endure as much as he did. He fought for 3 1/2 years this monster brain tumor. It took his right side leg and arm/hand function and speech. But it never took his faith, love and kindness. Before Brett became ill with cancer, I would tell him there was a special place in heaven for him. He was such a good kid. Brett took that special place in heaven at 9 pm on January 10th 2018. He is running in heaven free from all physical impairments and talking to all the kids. Cancer did not win, Brett won his place by Jesus being the special and caring boy he was. Remember to love and be kind to everyone. And love God with all your heart and soul. Like Brett. Services: Funeral from KUTIS CITY CHAPEL, 2906 Gravois, Monday, January 15, 9:15 a.m. to the Cathedral Basilica of St. Louis (4431 Lindell Blvd. 63108) for 10:00 a.m. Mass. Interment Resurrection Cemetery. In lieu of flowers, please help us fund a cure for brain cancer by making a donation to the St. Baldrick’s Foundation. Donations can be made on line here:https://www.stbaldricks.org/hero-funds/thumbsup or by check. Please make checks payable to St. Baldrick’s and note the donation is in memory of Brett Haubrich. Checks can be mailed to the St. Baldrick’s Foundation at 1333 South Mayflower Avenue, Suite 400, Monrovia, CA 91016. Visitation at Kutis City Chapel on Sunday, 3-8 p.m. (please note, day and place of visitation).